Top Home Appliance Repair specializes in professional home appliance repair, maintenance, cleaning, and installation. Our services are fast, reliable and reasonably priced. We perform refrigerator repair, washer repair, dryer repair, dishwasher repair, stove and range repair, oven repair, steam oven repair, microwave repair, freezer repair, ice maker repair, barbecue repair, pizza oven repair, patio heater repair and much more. We work for both residential customers and commercial customers alike. If you have a broken appliance, call us, and we will fix it right away for you! 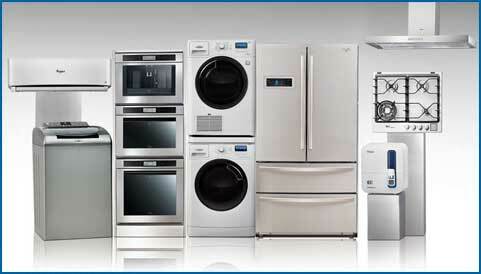 Our home appliance repair team excels in appliance diagnostics, repair, maintenance and customer service. They are factory trained and certified by most major brands. Those brands include Asko, Bertazonni, Bosch, Dacor, DCS, Electrolux, Fisher&Paykel, Frigidaire, GE, Jenn-Air, KitchenAid, La Cornue, LG, Liebherr, Marvel, Miele, Perlick, Samsung, Siemens, Sub-Zero, Thermador, Traulsen, True, Viking, Whirlpool, Wolf. In fact, there is not a brand or a model that we can not fix. We always try to implement the latest technology and use the most advanced equipment in our work. Our service vehicles are fully stocked and ready for any situation. We carry a majority of the appliance parts with us. This way it’s less likely that we need to order those parts. So, when you call us, you can be sure you are in good hands. Our company has been doing home appliance repair for many years. This extensive experience gives us advanced skills and knowledge. We are local, family owned and family managed a business. We always treat our customers with respect. Our home appliance appointments are fast, convenient and affordable. In fact, we are known for our honest upfront pricing with flat rates whenever possible. Please look out for our regular special offers for even more savings. Just one appointment with us and your broken appliance will be fully functional! We guarantee it! Besides offering residential appliance repair, we also offer commercial appliance repair services. For professional appliance repair in Oakland and East Bay please call us at 925-265-7782. For professional appliance repair in Novato and the rest of Marin County please call us 628-214-0064. Or you can fill out our short contact form. We would love to talk to you and answer all of your questions.